University Press of Colorado, 9780870819124, 307pp. Although most accounts of the Civil War's New Mexico campaign have focused on the Confederate effort, Distant Bugles, Distant Drums brings to life the epic march of 1,000 men recruited from Colorado's towns, farms, and mining camps to fight 3,000 Confederate soldiers in New Mexico. Drawing on previously overlooked diaries, letters, and contemporary newspaper accounts, military historian Flint Whitlock brings the Civil War in the West to life. Distant Bugles, Distant Drums details the battles of 1,000 Coloradans against 3,000 Confederate soldiers in New Mexico and offers vivid portraits of the leaders and soldiers involved - men whose strengths and flaws would shape the fate of the nation. On their way to Colorado in search of gold and silver for the Confederacy's dwindling coffers, Texan Confederates won a series of engagements along the Rio Grande. Hastily assembled troops that had marched to meet them from Colorado finally turned them back in an epic conflict at Gloriéta Pass. Flint Whitlock is the author of The Fighting First, Given up for Dead, The Rock of Anzio, and Soldiers on Skis. "By focusing explicitly on the North's reaction to Confederate dreams of empire in the West, Flint Whitlock adds several new insights to historical knowledge of this increasingly well-publicized theater of the Civil War." "An important new book by Denver military historian Flint Whitlock . . . this well-written, solidly researched history of Colorado's Union troops is eye-opening." "The depth of coverage for this period in Distant Bugles is one of its major strengths. 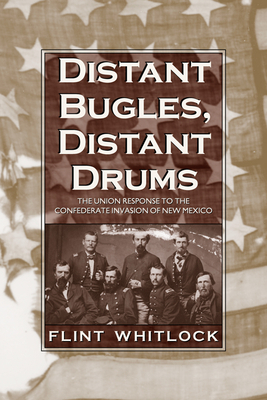 This original contribution alone warrants the book's placement on the list of standard reference works for this campaign....By focusing on the Federal response to the Confederate invasion of New Mexico (and Colorado's political and military role in particular), author Flint Whitlock has made an important contribution to the literature of the campaign." "This volume is Civil War military history at its very best. The research, especially in primary sources, is fresh, the interpretation is informed and concise, and the writing is skillful. Follow Whitlock's engagingly crafted narrative. He introduces you to the officers, soldiers, politicians, and merchants. He tells of their competence, loyalty, opportunities, and accomplishments."